.........It’s a really popular past-time here. 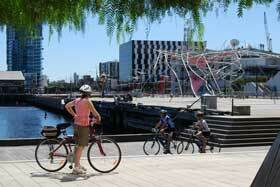 I'm always amazed how many cyclists there are on Beach Road, Bayside every weekend. ..........I’ve written brief details below of where the routes go but you can get full details of the routes with maps from the Melbourne Visitors Centre in Federation Square. Now I must admit that I haven’t cycled these routes myself yet as my wife can’t ride a bike (well, not very well anyway!) so I’m waiting for my daughter to get a bit older and then I’ll cycle them with her. ..........And take along a rug and picnic to eat in the gorgeous gardens or along the leafy riverbanks. 1/ The Main Yarra Trail, a 33 kilometre 5 hour cycle one way from the mouth of the Yarra River to Templestow running alongside the Yarra River for most of the route. 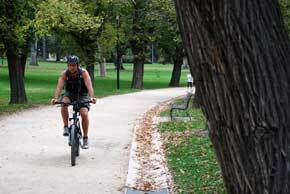 ........The trail continues through landscaped Westgate Park and then by the beach all the way to Brighton, through Port Melbourne, Albert Park and cosmopolitan St Kilda. 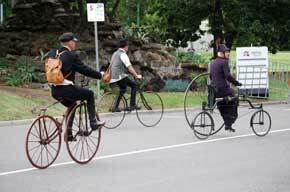 3/ The Maribyrnong River Trail, a 28 kilometre 3 hour trip discovering the fascinating past and beauty of the Maribyrnong River on this easy ride from the centre of Melbourne to Brimbank Park, a natural haven nestled in a sheltered river valley. ...........You'll find a number of drinking fountains have been placed around this trail approximately every 2 kilometres which is a good idea. You can also find details of these routes at www.bikely.com - just enter the name of the route in the search section. Be careful when looking for the Bayside Trail on Bikely.com though – the last time I looked different sections of it were listed and some just go from the city, not Point Gellibrand.